If you are an allergy parent, you probably know firsthand how stressful navigating social events can be. Not only do we have to pick and choose which events we attend based on how risky they may or may not be for our children, we are constantly on the lookout for allergens lurking behind every corner at said events, (even when an environment seems safe). Additionally, we need to bring safe foods everywhere we go (sometimes with little to no notice), and for most of us, picking up a cake or cupcakes from a bakery is not an option. Sometimes, even the events we most want to attend can become overwhelming. It is for these reasons that I have decided to start creating allergy friendly cake decorating tutorials, with a focus on quick, and simple ways to make professional quality baked goods out of allergy friendly ingredients and materials. I hope that this will help you guys out the next time you find yourselves in need of a safe treat–whether you need something to bring with to a birthday party, or you just want to create something special for your kids. 1.) Since the focus of this post is on decorating these cupcakes, (and not on baking them) we will be starting with cupcakes that have already been baked and cooled. To make mine, I used two Betty Crocker Gluten Free Yellow Cake Mixes, but you could use any brand of cake mix, or make cupcakes from scratch using your favorite recipe. If using a cake mix, be sure to check out this post to learn how to make the most of it. 2.) Assemble the cupcake wrappers by slipping the tab on one end into the slit on the opposite end. Drop the cupcakes into the prepared wrappers so that the cupcake liner is completely concealed. 3.) Next, you will need to prepare your frosting. To frost these cupcakes, I used one container of Pillsbury Creamy Supreme Milk Chocolate Frosting and one container Pillsbury Creamy Supreme Classic White Frosting. As mentioned above, these frostings contain soy, but they are gluten free, and free of the remaining Top 8 Allergens. While tasty, these particular frostings do tend to be on the thin side. They can be piped onto cupcakes immediately upon opening, but you can drastically improve their texture and workability by adding a bit of confectioners sugar to them. This stiffens them up, and gives them a more professional look and taste. To do this, transfer your frosting to the bowl of a stand mixer, and add 1/2 cup of confectioners sugar. Beat on medium speed until the frosting is smooth. Add another half cup of confectioners sugar, and beat again until smooth. Repeat these steps with each frosting flavor, separately. 4.) Fit a decorating bag with either a 1M or 2D decorating tip (I used a 1M), and fill the bag with chocolate frosting. Fit a second decorating bag with another tip (again, 1M or 2D), and fill with white frosting. 7.) Now for the really fun part–sprinkle the edible gold stars on the frosted cupcakes. Do this slowly and carefully, to avoid dropping them in clumps. 8.) Insert a cupcake pick into the center of each cupcake. Push it down just until the pick is no longer visible. I chose to use all of the diploma cupcake toppers with the chocolate frosted cupcakes, and all of the graduation caps with the white frosted cupcakes. This choice was purely based on my personal aesthetics, though. 9.) At this point you should be left with 12 unfrosted cupcakes. Using the white frosting, pipe a star in the center of each of these cupcakes. 11.) Sprinkle edible stars over the white frosted cupcakes. 12.) Insert the remaining cupcake toppers into the cupcakes. Enjoy! 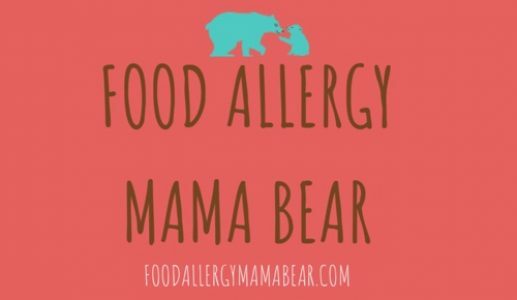 NOTE: Please check (and double check) any and all labels before you consume a new product if you (or your child) has a food allergy, and if necessary call the relevant manufacturer to confirm that the product is safe for you (or your child) to consume. Please consult your (or your child’s) Dr. before making any dietary changes. While I hope that all of you reading this will find the information I have supplied above to be helpful, this information is not intended to in any way replace, or supersede, the care and advice of your allergist, nutritionist, dietician, or other medical professional. O I love those cupcake sleeves! Awww, Its so pretty. I am sure I can’t do it but will give it a try. These look so good!!! Can’t wait to try! These are so cute! What a great idea to compile allergy friendly recipes. I’m sure a lot of families will find this useful! You did such a great job! I wish I could decorate my cupcakes this pretty! I love it!